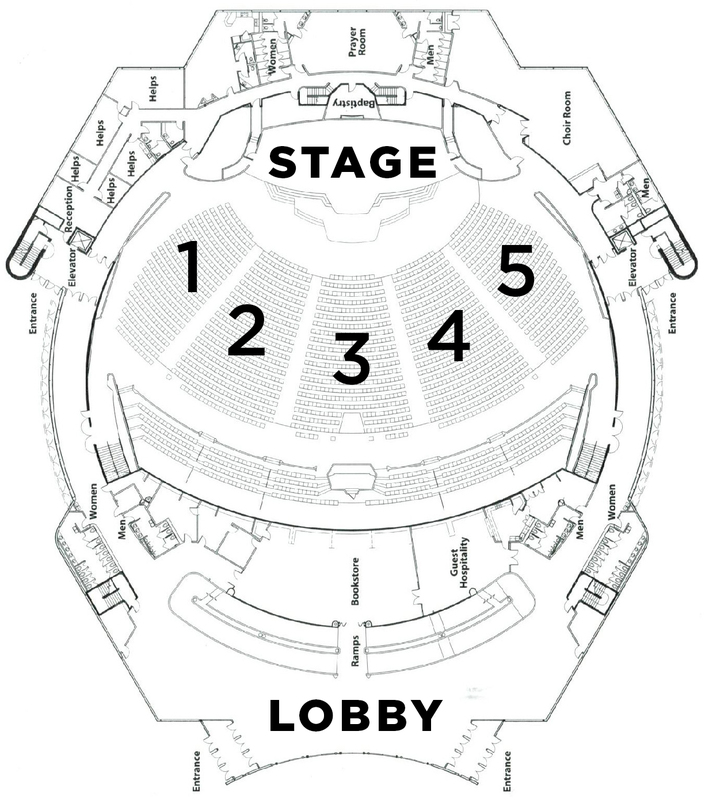 A Place to Belong– A section of seats is naturally divided based on the way the auditorium is laid out. In addition to worshipping as one person in a large group of thousands, each person also has a place to belong in a medium group, with those sitting in the same section. A Place to Make Friends– We are creatures of habit. Almost everyone has their favorite place to sit. So you see the same people each week and you become friends. Relationships grow more quickly when you see each other regularly. A Place to Meet– If you meet someone new, having a particular section and service where you sit lets them know where they can find you. A Place to Connect– Your Section Community Leaders will get to know you, assist you in meeting people in your section, and help you feel even more a part of the life of the church. A Place to Be Cared About– The Section Communities are built for caring. We care about you and your spiritual growth as well as your life situation. We want to be there for you when it’s a time to celebrate, when you go through a transition or struggle, or when you have an illness or a loss. We want you to feel welcomed when you are here and missed when you are away. Meet and build friendships with your Section Leaders & fellow Section Community members at church. Snacks After Service/Quick Connects happens usually once monthly. You will receive an email reminder and handed an invitation at the service. These events are in the Main Lobby. Meet us for snacks and conversations. Meet @ Meals happen usually quarterly. You will receive an email reminder and handed invitations at the 3 services prior to the event with expectation of an RSVP. These are usually on campus right after the service. Enjoy a celebration, a meal, and building friendships. Ministry Projects happen a few times a year. Your Section Community will be involved in outreaches and missions. Small Groups and Classes. Your Section Community leaders can help you find the small groups and classes that are right just for you! Volunteering. Your life at the church will be even more fulfilling when you join a ministry team.